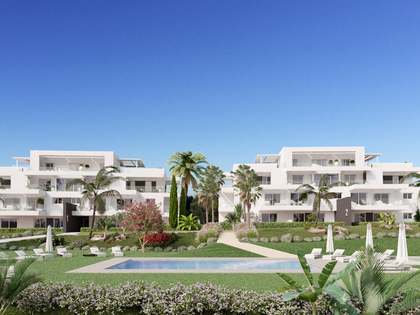 Stunning newly built 2-bedroom apartment, for sale in Estepona, Malaga. 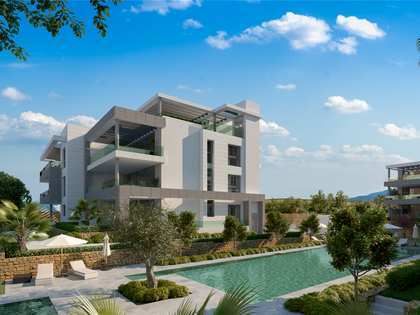 This fantastic New Development property is located in Estepona. With its exceptional design this development is something really special. The property is south facing therefore receives lots of natural light and stunning views as far as Gibraltar and Africa. The property takes advantage of communal areas including an infinity pool, gym and garden areas. This particular apartment measures 115m² with a 22m² terrace. The property has 2 spacious bedrooms and 2 bathrooms; the whole living space has a comfortable and intuitive layout. Finishes and materials can be selected by the individual to personalize the property and make it feel like home. Emphasis has been placed on energy efficiency so that the property has a minimal impact on the environment, energy certificate A. 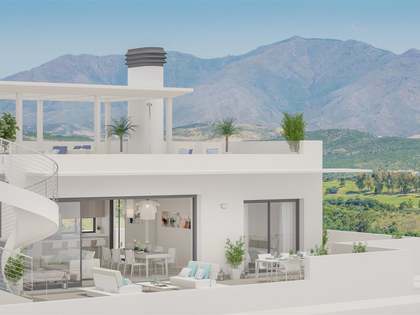 This could be the ideal home for couples or families looking for an exquisite new home in Malaga. In a truly privileged location in Estepona, Malaga, this property enjoys a tranquil setting surrounded by the Parque de Las Mesas. In the area there are ample commercial zones, gardens, sports facilities and schools. There is also a golf course nearby. Estepona is only a few minutes from the historic city centre. Malaga airport is less than 1 hour away and the A-7 and AP-7 can be accessed easily.